"Select Ch Eko-Lan's Shiloh brings his father, Ch Eko-Lan's Morgan back to the achive listings. Shiloh is the result of Morgan bred back to his daughter, Eko-Lan's Helena. I feel Shiloh would have attained his title sooner had it not been for the formidable competition offered by his father and his half-brother, Paladen. 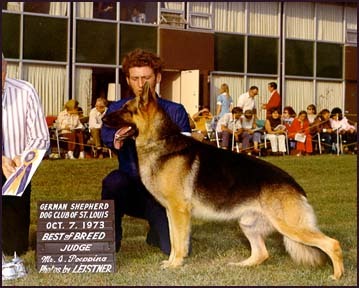 Please not that in 1982 there are three Eko-Lan dogs currently on the active list."